According to the Palestinian schoolbooks, Jews have no rights whatsoever in the region but only "greedy ambitions." The books also say that Jews have no holy places. Schoolbooks used in UNRWA in Gaza and the West Bank display extreme anti-Israel and anti-Jewish sentiments, according to a review. In the study released on Wednesday by the Center for Near East Policy Research, the Simon Wiesenthal Center and the Middle East Forum, it also found that the United Nations Relief and Works Agency books showed there was no hope for peace in the region. The research, authored by Arab-textbooks expert Aaron Groiss, in collaboration with leaders of each of the involved organizations, examined 150 textbooks of various school subjects, taught in grades one to 12. Seventy-five of the books checked were published in 2016 and 2017 as part of a project initiated by the Palestinian Authority, which provides its curriculum to UNRWA schools. The contents of the books were analyzed focusing on the depiction of the Jewish/ Israeli "other," which revealed three fundamentals: delegitimization, demonization and indoctrination to violent struggle instead of peace. According to the Palestinian schoolbooks, Jews have no rights whatsoever in Palestine but only "greedy ambitions." The books also say that Jews have no holy places there either  the Western Wall in Jerusalem, the Cave of the Patriarchs in Hebron and Rachel's Tomb in Bethlehem are all presented as Muslim holy places threatened by Jews. The study also shows that cities established by Jews in modern times, including Tel Aviv, are sometimes not shown on maps either. "Israel is not a legitimate state according to the PA schoolbooks studied at UNRWA schools," the study said. "The name 'Israel' does not appear on the map at all." In many cases, "Palestine" appears instead and covers Israel's pre-1967 territories as well. The almost complete erasure of the name "Israel" from the schoolbooks is "a disturbing development," the researchers wrote. "Including the numerous demonizing descriptions of the Jewish state and its replacement by the expression 'Zionist occupation.' "Even the former expression 'the Arab-Israeli conflict' is now spelled 'the Arab-Zionist conflict,'" they added. "This change signals an intensification of the nonrecognition attitude regarding Israel on the part of the Palestinian educators." While demonization of Jews is less evident in the PA schoolbooks compared to books of some other Arab governments, Jews are still demonized as opponents of Islam's revered prophets, namely, Moses, Jesus and Muhammad. "The first group of Jewish settlers came to Palestine from Russia in 1882 and the second group was in 1905," one of the books reads. "The arrival of the Jewish throngs to Palestine continued until 1948 and their goal was taking over the Palestinian lands and then replacing the original inhabitants after their expulsion or extermination." Israel is also presented as an enemy who aims its weapon at Palestinian children. When it comes to the Arab-Israeli conflict and possible solutions, peace is not advocated in the schoolbooks used in UNRWA schools. Instead they promote a violent struggle of liberation against the "occupation." A book of the 2016 edition emphasizes a poem with the motif of the struggle for the liberation of al-Aksa Mosque and of the whole country, beyond the territories Israel took over in 1967, namely, Haifa and Jaffa. The study also pointed out that the violent liberation is further intensified in the books published in 2016 as they now include, for the first time in the history of the PA curriculum, a reference to the fate of the 6 million Jews living in the country after its supposed liberation. According to the texts, they will endure expulsion from the land and "extermination of its defeated and scattered remnants. A 2017 text even reveals a shocking attitude to Israelis by describing a Molotov- cocktail attack on an Israeli civilian bus as a "barbecue party," and another such text exalts a Palestinian female terrorist responsible for the killing of more than 30 civilians in an attack on another Israeli bus. 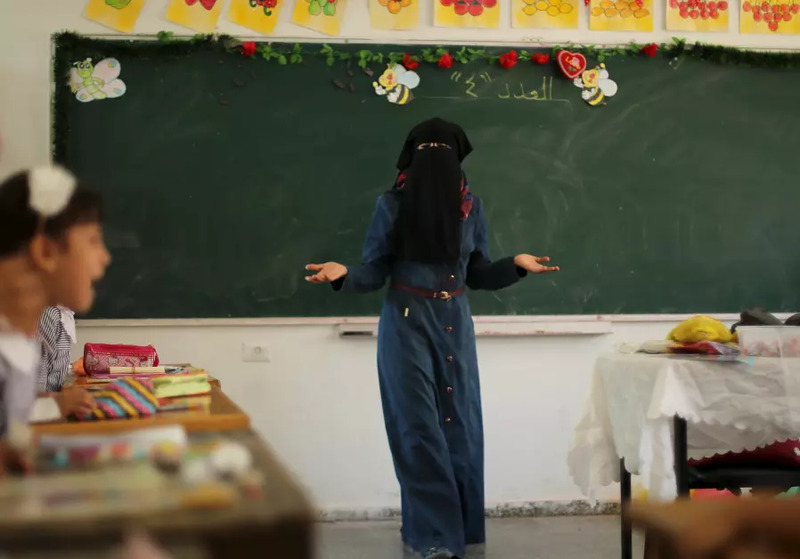 "This list of items taught in UNRWA schools is incriminating," the researchers concluded. "UNRWA, in fact, not only does propagate a non-peaceful line contrary to UN resolutions on the Middle East, and not only does allow the presentation of Israel and its Jewish citizens as illegitimate with heavy layers of demonization. UNRWA also betrays its moral obligation toward the Palestinian children and youths' human rights and well-being, by letting the PA preparing them for a future war with Israel." Using these textbooks, they added, is the UN agency's contribution to perpetuating the conflict. "It is now high time that UNRWA change its policy of nonintervention in the contents of local curricula taught in its schools," they added. "An international organization of this caliber committed to the ideal of peace and relying in its funding on democratic countries mostly, should have a say in this matter, especially in view of its relatively large share of Palestinian educational activity." The authors of the study made clear they strongly believe that a meaningful peace must start with education and that "there are things that UNRWA must not teach." About half of UNRWA's total regular budget is dedicated to education. The agency offers also health and social services. UNRWA provides free-of-charge basic education to children of Palestinian refugees in the Palestinian Authority-controlled West Bank, the Gaza Strip and east Jerusalem, and in Jordan, Syria and Lebanon.